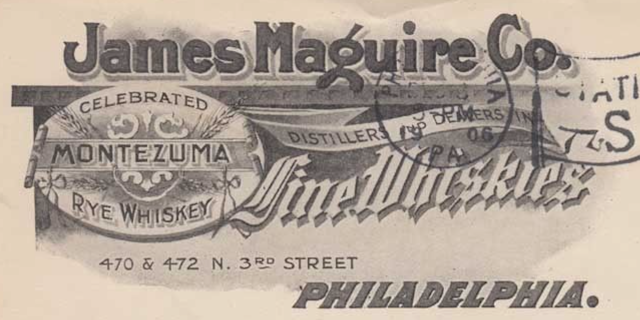 The "whiskey mark" of the James Maguire Co." printed on a company postcard. 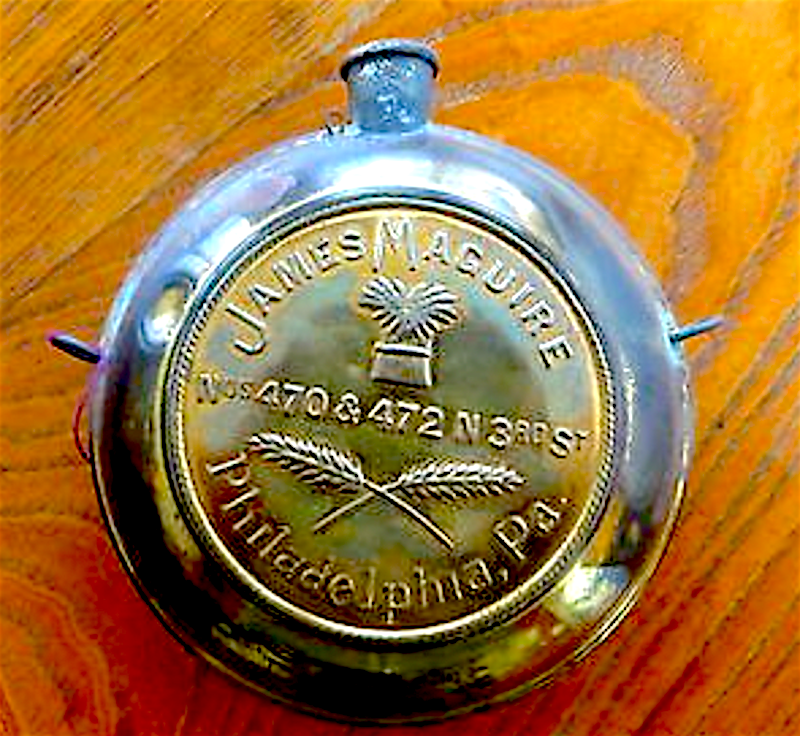 Just in time for St. Patrick's Day, a cousin on my mother's side posted information about our mutual great-great grandfather James Maguire and his whiskey empire. Upon the tract of 103 acres at Eddington, Bucks county, which has just been purchased from Mrs. Morris, a wealthy Pottsville widow, will be erected an enormous distillery for the production of rye whisky. The plant will be operated by a new company which has just been organized with a capital of $3,000,000, and which will be known as the Philadelphia Pure Rye Whisky Distilling Company. Nearly every large liquor dealer in this city holds stock in the company. Despite the fact that the organization of the company has been accomplished so quickly, considerable work has already been done, and the contract for the erection of the buildings will be awarded at a meeting of the Board of Directors tomorrow. Quite a number of bids have been received. Under the present laws of Pennsylvania there can be no president of a liquor company. Angelo Meyers has been elected Chairman; Henry Van Beil, Secretary, and James Maguire, Treasurer. These gentlemen, with Samuel Humphrey and Louis Gilliams, constitute the Board of Directors. "No, we will not be antagonistic to the Whisky Trust, because the trust does not make rye whisky. The principal advantakes to the stockholders will be in establishing a home industry, which will enable us to economize on shipping. 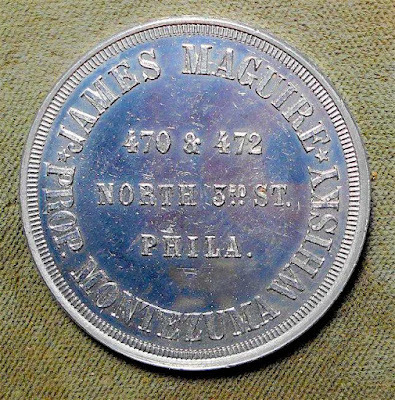 We can probably secure sufficient grain from the farmers of Bucks county to keep us going, so we will not suffer from lack of material. Then, too, we are going to try some new experiments in the manufacture of whisky which are entirely original, and which, if successful, will have a tendency to revolutionize things." Apparently this is what they meant by Whiskey Trust - according to this article it ended in 1895 anyway, so they needn't have worried. Here is a description and images of the Distillery by way of the Philadelphia Library's collection of historical images from the Hexamer General Surveys from 1894. The Distillery was powered by four steam engines. 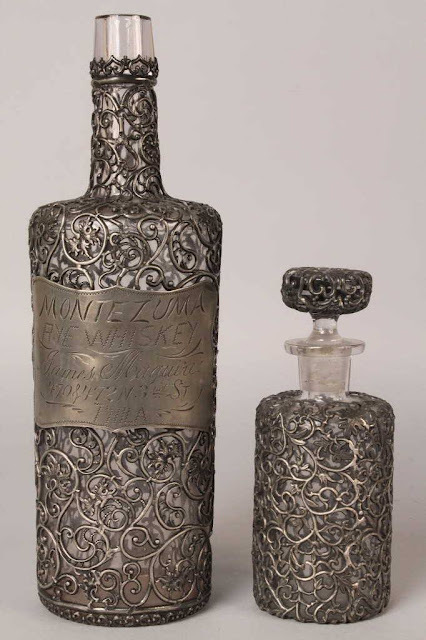 So it turns out that there is a market for pre-Prohibition era artifacts associated with the alcohol business. And it turns out that my great-great grandfather James had lots of artifacts celebrating the celebrated Montezuma Rye Whiskey produced by the Philadelphia Pure Rye Whisky Distilling Company, and many are for sale online. Here is more about those collectables. of the business as well as its most celebrated product. But there it is. 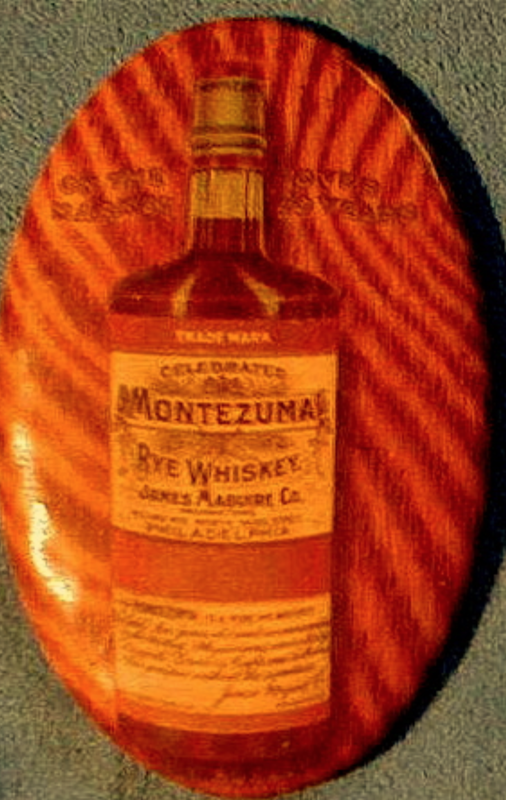 Pocket mirror case - I assume this is what the bottle looked like. 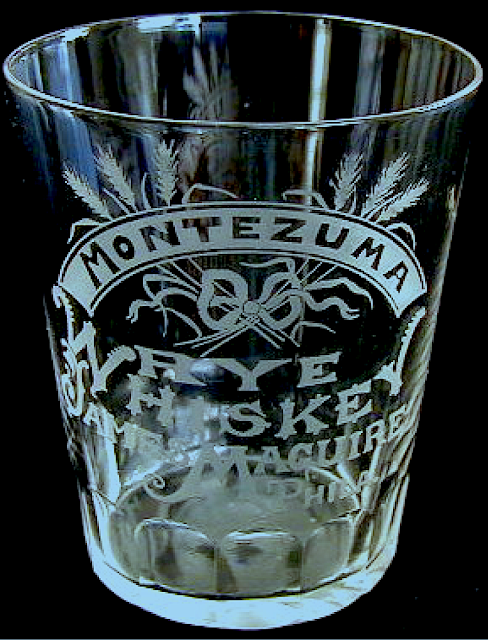 Please note that the name "Montezuma" was trade marked. Here is something more utilitarian. 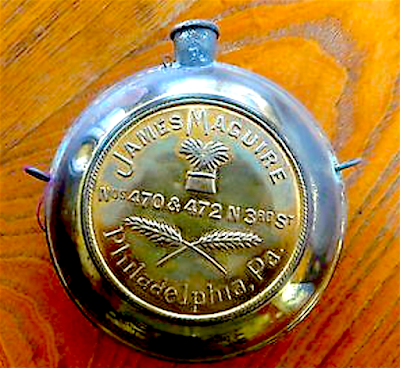 A small whiskey flask, with the name and address of the business.